Blue Earth would not be a typical pick for me when deciding on a new book to review, that being said I really enjoyed reading it! Jeff Stover paints a detailed and wonderful story in this page-turner of a book. The book takes place in a futuristic setting the story and the characters within making it seem not necessarily plausible, but definitely possible. I found myself totally swept away by this book starting with the intro. There is an intriguing mystery that runs through the whole story, as well as some interesting and unique characters. I enjoyed Stover’s diversity of personality among the main characters. Blue Earth is fast paced, with tons of action, cool sci-fi ideas and genuine heart. Embattled doctoral candidate Ruth Long struggles between playing it safe in the conservative world of academia and reaching out to truly discover humanity within a 12-member brotherhood of mutants, called Thrones. Jamal Battle, a former soldier turned bounty hunter, must determine whether he will continue to destroy for the rest of his life, or finally protect creatures with primitive values which are now so foreign. Stover set a lofty goal for himself when writing Blue Earth – blending science fiction with religion. Not only does he meet this goal, but also he does so with a mix of tact and tenacity that few sci-fi authors are able to reach. The world that Stover creates around the reader is as compelling as it is mysterious, and the juxtaposition between Jamal and Ruth highlights his ability to create a dynamic spectrum of personalities that will keep you hooked from page one. 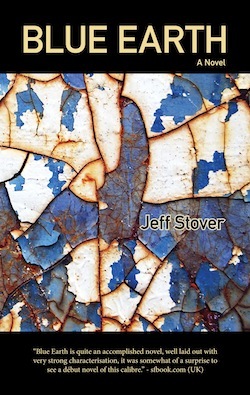 If you’re into science fiction and are a deep thinker, this is definitely a book you want check out – and Jeff Stover is an author you’ll want to keep your eye on.